Is a company paying its “fair share” of taxes? Incorporating the question into tax planning is critical. In recent years, corporate tax strategies have become the focus of some high-profile public debates. Last year, for example, tax inversion deals received scorching criticism from regulators and lawmakers. One prominent critic — President Barack Obama — likely helped spur the Treasury Department to issue rules discouraging such maneuvers. In the long shadow of a financial crisis that ushered in the phrase “too big to fail,” the public has become more attuned to — if not downright suspicious of — corporate motivations for tax strategies. Hungry for tax revenue, cash-starved governments around the world also have pushed for greater transparency in corporate tax returns. Corporate leaders have understandably become more wary of getting singed by the white-hot scrutiny. As a result, finance executives have found that they have an important role in tax that is over and above just assessing complex accounting and financial impacts. That role is to calculate the implications that any tax decisions could have for a company’s public image and reputation. Such wide-ranging considerations are a far cry from the way that many corporations have historically treated tax issues. In the past, a company’s tax function might have toiled in near-seclusion. During their deliberations, tax experts would balance two competing factors: the fiduciary responsibility to comply with all relevant laws and regulations, and the corporate directive to protect profit margins by minimizing tax liabilities. Now, finance executives have to add another layer of scrutiny to those traditional considerations — whether the company’s tax strategies, in the eyes of the public, could be viewed as loophole-driven, devious, or even unpatriotic. To assess how much influence public awareness — among other external and internal factors — exerts on tax planning strategies, CFO Research conducted a study of finance executives at large U.S. companies. The project, co-sponsored by KPMG LLP, the audit, tax and advisory services firm, included an online survey which was sent to U.S. finance and tax executives employed at companies with more than $1 billion in annual revenues. In addition to analyzing the 112 responses to the survey, CFO Research also conducted in-depth interviews with two senior executives at U.S. companies with international operations. The survey found that companies in financial services are most likely to be sensitive to tax considerations, perhaps because those businesses have had to respond to an especially heightened level of regulatory scrutiny. Not that executives in other industries are deaf to the strident voices of investors, customers, and other stakeholders who may be concerned that corporate tax-avoidance strategies have added to the burden that other taxpayers must bear. In nearly every industry represented in the survey, more respondents acknowledged the influence of tax than said it had little or no influence. Corporate taxes, after all, aren’t exclusively financial or regulatory issues; so-called “tax morality” also enters into the discussion: What does it mean for a business to pay its “fair share,” and how active should businesses be in fulfilling the duties of corporate citizenship, contributing to the community by creating jobs, funding economic development, and engaging in philanthropic endeavors? 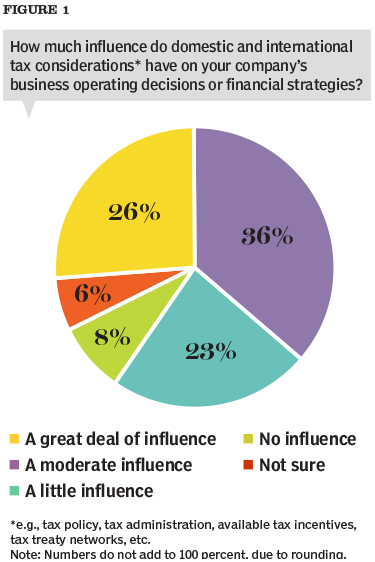 Among survey respondents, about 40% characterize their boards and management as “aware” of the ongoing debate regarding corporate tax morality, but not overly concerned about it. About half as many, or 23%, report that their boards and top management are “engaged” with the topic, taking a more active interest in the potential implications and outcomes of their tax policy. On the other side of the spectrum, a nearly identical number, 21%, report that their boards and top management were either “passive” or simply “not aware” of the issue of tax morality. As most companies in the survey are well aware, the list of tax issues that draw public scrutiny never remains static. New pressures are always bubbling to the surface. 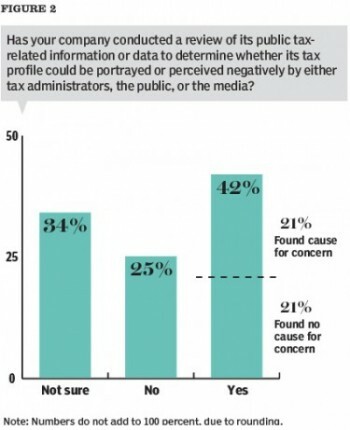 Perhaps that is why just short of 80% of survey respondents say that their companies monitor news media for reports about their own tax profile or tax strategies. Half of these companies have formal processes for doing so, while the other half monitor news reports more informally to stay on top of the latest developments. For example, during this frigid winter, finance executives perhaps could be excused for entertaining visions of the Cayman Islands or the Bahamas. But these tropical hotspots, among other Caribbean nations, have also garnered renewed attention for their status as tax havens for U.S. companies. As with last year’s brouhaha over tax inversions, President Obama has proposed a plan to address the issue of low- or no-tax havens. Yet approximately seven in ten finance executives in the survey say their companies are unlikely to consider, or aren’t sure if they would consider, either merging with a company in a more favorable tax environment or re-incorporating overseas. But the smart companies will still be watching events as they unfold, if only to make sure they are prepared to make the right decisions, for all the right reasons. White House might say to the contrary. He wants companies to pay more so he can buy more votes, not because it is “the right thing to do”.